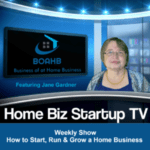 I have my HomeBizStartupTV weekly digest up on iTunes subscribe now! Have you dreamt of firing your boss and starting a business of your own from home? This weekly show for the new online business owner provides information on marketing skills, tips and actionable strategies to start and grow your own home business. Learn sales training, customer support and online marketing , internet systems setup, free software and tools, empowerment strategies and success mindset techniques for the home business entrepreneur. 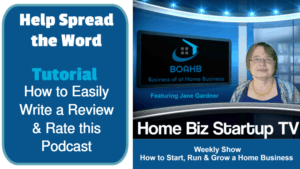 Get your weekly dose of home business mentorship from Jane Gardner, a home business entrepreneur for the past several decades. But now all a visitor has to do is click on the “View” and they can easily go to your podcast or videocast on iTunes! Amazing! With Widget Builder, you can easily add interactive widgets to your website or blog. These widgets allow users to explore music, preview songs, and find albums from iTunes. Users can also discover apps from the App Store—all without leaving your site. HERE is my “View” links for my vlog “HomebizStartupTV” and podcast “Solopreneur Success Strategies” on iTunes!